NEW YORK, NOVEMBER 2015—On 22 December, Sotheby’s New York will auction 12 extraordinary items from The Valmadonna Trust Library—the most important private library of Hebrew books and manuscripts in the world. The auction follows the Library’s wildly popular exhibition at Sotheby’s in February 2009, which presented all 11,000 items on public view together for the first time, and drew thousands of excited visitors, including many scholars and collectors. The group of items on offer in December will include the legendary Valmadonna copy of the Bomberg Talmud, as well as the magnificent Hebrew Bible produced in England in 1189, the only dated Hebrew manuscript preceding King Edward I’s 1290 edict expelling the Jews (estimates $5/7 million and $2/4 million, respectively). This remarkable selection will be on view in New York from 16-21 December, alongside highlights from Sotheby’s Important Judaica auction. The Valmadonna Trust Library is the product of the far-reaching vision and passion of a single collector, Jack Lunzer. During the first part of the 20th century, the family of Jack Lunzer’s wife had acquired a representative library of Hebrew books printed in Italy during the 16th century, a period often referred to as the ‘golden age’ of Hebrew printing. The name Valmadonna derives from the village near Alessandria, in Piedmont, Italy, with which Mr. Lunzer’s family has been connected since World War II. This group of splendid Hebrew imprints was acquired by the Valmadonna Trust shortly after the end of World War II, and vastly expanded by Mr. Lunzer from a few hundred original volumes to 11,000. Nevertheless, his aim was not to assemble a large library; it was to assemble a great one. He assiduously pursued single items for decades, traveling to the most remote corners of the world to bring the library together; seeking the finest possible selection of books that are truly indispensable for illustrating and understanding the Jewish Diaspora. Daniel Bomberg is responsible for the first complete edition of the Babylonian Talmud (1519-1523), universally recognized not simply as one of the most significant books in the history of Hebrew printing, but as one of the great books of the Western world. 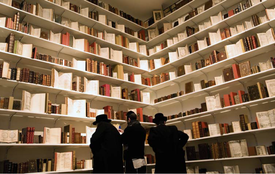 Among the Valmadonna’s many highlights is one of the finest copies in the world of Bomberg’s Talmud, remarkable considering only 14 complete 16th century sets survive. The Talmud, or “Oral Law,” is a compendium of hundreds of years of rabbinical discussion and debate which expound upon the laws of the Bible. The Talmud thus functions as the guiding framework which has given form to Jewish life and ritual observance across the centuries. Daniel Bomberg, a Christian printer of Hebrew books, was responsible for the first comp lete printed edition of the Babylonian Talmud, whose format remains the model for all subsequent editions. The Valmadonna Library’s copy of a nearly perfectly-preserved Bomberg Talmud was kept for centuries in the library of Westminster Abbey. In 1956, Mr. Lunzer attended an exhibition at The Victoria and Albert Museum celebrating 300 years of Jewish resettlement in England. It was there that he first became aware of the Abbey’s magnificent and complete copy of the Talmud, and vowed somehow to acquire it. He spent the next twenty-five years determined to fulfill this virtually impossible ambition. Eventually, he purchased a 900-year-old copy of the Abbey’s original Charter, and presented it, along with supporting endowments, to the Abbey in exchange for its copy of the Bomberg Talmud (est. $5/7 million). A further highlight of the group is one of the most important privately-owned manuscripts in the world - a Pentateuch (the first five books of the Bible), written in England during the summer of 1189. Known as the Codex Valmadonna I, this extraordinary book is the only dated Hebrew text that survives from Medieval England, before King Edward I’s 1290 edict expelling the Jews (estimate $2/4 million). Only two months after the bible was completed in July of 1189, the Jewish community of London — the largest in the country — was destroyed during riots that coincided with the coronation of King Richard I. With the expulsion of Jews from the Iberian Peninsula at the end of the fifteenth century, Sephardic Jews were dispersed to every corner of the known world. With them they took their most precious possessions, their books. Even so, complete Hebrew bibles written in pre-expulsion Iberia are exceedingly rare. In addition to the biblical text itself, this manuscript includes the masorah, the system of extra-biblical notations which ensures the correct transmission of the writing and reading of the Hebrew Bible (est. $1/1.5 million). The oldest extant dated manuscripts of the Hebrew Bible were executed in the tenth century. This manuscript is among the earliest copies of the Pentateuch written in Europe (est. $1.5/2 million). Each biblical verse is followed by its Aramaic translation, a tradition hearkening back to antiquity, when Aramaic was the lingua franca of the Jewish people. The scribe completed the text of the Pentateuch with an elaborate flourish, artistically penning the final word, Yisrael (Israel). Manuscript copies of the Talmud from the Middle Ages are exceptionally rare in light of the frequent confiscation, censorship and destruction of Talmud volumes by ecclesiastical authorities. Written in a fifteenth century Sephardic hand, the text of the Mishnah is penned in square letters and the Gemara in semi-cursive script. Based on an analysis of the paper as well as on codicological and paleographical evidence, Professor Malachi Beit-Arié has demonstrated that this work was written in Provence between 1447 and 1452 (est. $300/500,000). Rabbi David Kimhi, best-known by the Hebrew acronym Radak, was a thirteenth-century grammarian and exegete from Provence. His biblical commentary was among the most popular and widely studied exegetical works of the medieval period. The ornamentation of this manuscript reflects the high caliber of Italian Hebrew manuscript decoration in the 15th century, when the art of illumination reached a new peak. The pages are embellished with vibrantly colored floral motifs and richly illuminated in gold leaf in the late Gothic style of Northern Italy (est. $300/500,000). This exquisite manuscript, comprising a variety of occasional blessings, is emblematic of the renaissance of illuminated Hebrew manuscript production in the eighteenth century. Skilled scribe-artists were frequently commissioned to create these beautiful small books on behalf of their patrons, many of whom functioned as Court Jews. Although the scribe has not signed this book, scholars have identified this manuscript as the work of Ze'ev Wolf Herlingen, one of the foremost scribe-artists of the period (est. $150/250,000). The Pentateuch, the “crown” of Hebrew books, was referred to by Jews of Arab lands as Keter in Hebrew and as Taj in Arabic. Although the square, bold script of this Pentateuch resembles other fifteenth century Yemenite Bibles, this manuscript is notable for its colorful decoration: stylized figures of birds, geometric patterns, and other floral designs. It is nevertheless consistent with Oriental Hebrew manuscript tradition in the complete absence of textual illustration and, certainly, of human figures (est. $150/250,000). The Hebrew texts penned by master scribe Benayah ben Saadiah ben Zechariah, in Sana, Yemen are noted for their accuracy and beauty, and for very good reason. The text ends with the statement that the present work is “completely according to the arrangement of the book which was in Egypt, which was edited by Ben Asher....” The reference is to the work known as the Aleppo Codex, universally recognized since the time of Maimonides as the most accurate recension of the Hebrew Bible (est. $200/300,000). Samaritans, who claim descent from the post-Solomonic northern Israelite kingdom, only include only the Five Books of Moses in their biblical canon. While they do not recognize divine authorship or inspiration in any other book of the Hebrew Bible, they do maintain a non-canonical secular version of the book of Joshua. This exceedingly rare miniature Samaritan biblical code x was formerly in the fabled collection of David Solomon Sassoon (est. $80/120,000). Samaritan Torah Scrolls from before the modern era are extremely scarce, and the Valmadonna scroll is among the oldest surviving witnesses to this ancient biblical tradition. Though there are thousands of mostly minor textual variants between the Samaritan and Hebrew versions of the Torah, the most obvious difference between them is the unusual and distinct Samaritan script (est. $40/80,000). This petite illustrated pray er book is characteristic of an eighteenth century luxury volume which, among Jewish families of means, would have been commissioned by a groom as a gift to his bride. It includes prayers traditionally recited by women including for the lighting of Sabbath candles, the separation of dough used in baking bread, and ritual immersion. Additionally the manuscript includes supplications written in Yiddish lettering called Wayber-Taytsh (women’s script); a distinctive script also used in printed editions of Yiddish texts, especially those intended to appeal to a female reading audience (est. $80/120,000).